I love to make homemade muffins. One of my boys is very limited in what he will eat right now (we're working on that) and muffins are his favorite breakfast. I am always shocked at the sugar content of commercially baked muffins so I am really happy when I can give him something made from scratch that is a bit healthier. He absolutely loved these and we will definitely be making them again! We bought some really delicious homemade apple butter on a recent trip to a local farm, and I thought it would make a great addition to a muffin recipe. The apple butter was made right at the farm and only contained apples, spices, and a touch of honey. You could probably make these with apple sauce instead, but I don't think the flavor would be nearly as rich. Preheat oven to 400 degrees. Grease 2 mini muffin pans (for 48 total muffins) and set aside. With a hand held mixer, cream together butter and sugar. Add in eggs, apple butter, and vanilla and beat until well combined. In a separate mixing bowl, blend together dry ingredients. Add to wet mixture and mix until fully incorporated. Scoop muffin batter into prepared pans. (I use a scoop like this - so easy!). Bake in preheated oven for 8-9 minutes or until a toothpick inserted in the center comes out cleanly. Serve warm. So delicious! This recipe makes 48 mini muffins, and they freeze beautifully. I like to put several in quart sized freezer bags and freeze, then set out a bag at night to thaw. Or if you forget you can thaw them in the microwave in the morning. 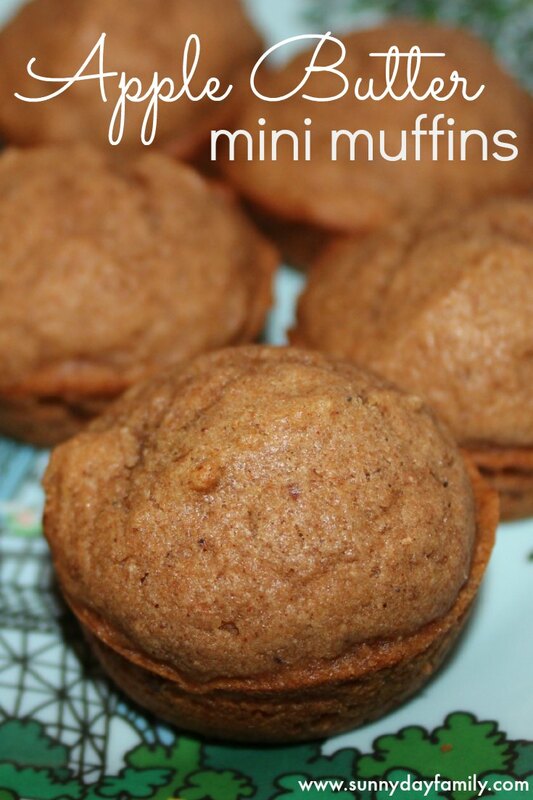 I always make mini muffins because I am feeding toddlers, but this recipe can be easily adapted to full size. Just cook them longer (14-15 minutes) and check for doneness. If you like this recipe you will love our Apple Squash Bread too! Thank you for this recipe - it sounds yummy! I am printing it out so I can make it for my Wednesday morning coffee klatch next week.